There is a complete list of the top rated open-source free DVD rippers working on Mac and Windows. Although they are totally free to use, you can enjoy full features to rip and digitize DVD to MP4, MOV and other popular formats for playing on Apple TV, iPhone, Plex or other media server. The content of a full title DVD movie can take up some space and is a tad difficult to enjoy and share, especially when you are out of house or office. Worse still, the DVD disc, made from plastic materials, is such a vulnerable stuff to be easily scratched or damaged. Thankfully, there are a bunch of programs designed to freely liberate your DVD movies from the plastic cell and make a digital copy of DVD movies to be playable on any handheld device at your willing. Below are the best open source DVD rippers on Mac and Windows based on your nominations. When everything comes down to freely disable DVD copy protection and copy DVD on Mac OS X with untouched quality, no one towers over MacX DVD Ripper Mac Free Edition. As the rising new king in DVD ripper community, it gains a good reputation thanks to its powerful ability in DVD encryption tech removal. See, no matter the homemade DVD or commercial DVD protected by CSS, Region Code, RCE, UOPs, or Sony ARccOS, Disney Fake, it can trouble-free circumvent all of them and rip DVD to MP4, MOV, M4V, etc. or extract audio from DVD as MP3, AAC, AC3, etc. for playback on any Apple TV, iTunes, iPhone iPad Android device with 1:1 lossless quality. Yes! How could we leave out the world-famous Handbrake? It's seemingly that we're accustomed to rip DVDs with this open source program, for the majority of us get involved in the field started with Handbrake. It has a long story in DVD ripping field. But we have to admit it has a long way to catch up our needs currently. Cuz once we apply it to rip the latest encrypted DVDs, it will appear various problems, like Handbrake can't rip 99 title DVD, Handbrake fail to find out the valid source, video audio out of sync in Handbrake, etc. All these Handbrake problems result from its inability in DVD copy-protection removal. One more thing to note is that Handbrake is only able to convert DVDs to MP4 and MKV, with support for iPhone, iPods, PSPs, Apple TVs, PS3s. So if you are holding a latest iPhone iPad or Android, Microsoft device, you are suggested to look somewhere else. No surprise, another excellents program is the MacTheRipper, which works as quite a beast in DVD copy protection breaking and DVD movie content ripping. To be specific, it can skirt the majority of DVD encryption tech and rip DVDs to VOB file format. And if you are in demand of converting DVD to other video format like MP4, MOV, you need to seek help from the third party. Warm Prompt: this free DVD decrypter has a little bit low frequency in software updating. It contributes itself only on Mac OS X 10.7 or earlier version, so in case you update your Mac OS to Mac OS X Mountain Lion or higher version, resorting to MTR alternative sounds good. Another alternative DVD Shrink halted development back in 2005, but this shining star isn't forgotten by its loyal Windows fans. Dozens of DVD Shrink lovers recommend this free DVD ripping software to me, insisting it's worth a place in this list. As the former info mentioned, it stops updating since 2005, which means its once-powerful DVD decrypting ability falls behind and is powerless to get rid of the latest DVD protection tech. To test its decryption skill, I give it a shot with the latest DVD Big Hero 6, Into the Woods, Taken 3. The conclusion I get is that I ask too much from it and I should not blame it for its inability. But I have to say when it does work (certain purchased DVDs), it works amazing and generates small files that are great for portability. And another strength lies in its compression, which will compress your DVD movie to suitable file size and you are hard to find any decline in movie quality. Last but not least, MakeMKV joins the list of impressive open source DVD ripper because of its extraordinary capability in quickly and easily rip Blu-ray discs and DVD to MKV files in high quality with a single click. And it's also famous for its cross-platform performance that it's compatible with Windows, Mac and Linux. Certainly, it's not perfect. Two drawbacks you need to know: One, it's acclaimed to be friendly with Mac OS X Mavericks or Yosemite, but the truth is that it causes crashes but nothing. Two, the ripping feature is free and will always stay free. Yet, the features of Blu-ray decryption and processing are only free for 30 days. After the 30-day trial, you may have to pay USD $50 to purchase a registration key to continue using its function of ripping Blu-ray discs. Nothing is perfect, indeed. The above open source DVD rippers are of no exception. And it's quite irresponsible to say which one is the best. What I can say is that the most suitable one is the best one for you. So case by case, if you look for a free software with cross-platform, Handbrake and MakeMKV are strongly recommended for you. 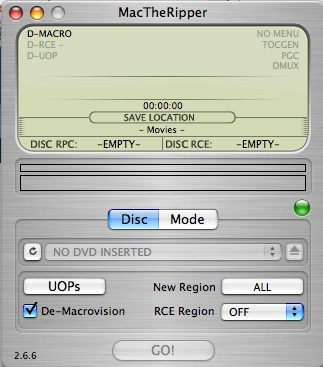 For those guys who wanna get a solid free DVD decrypter yet ripper on Mac, MacX is second to none. And supposing you are the one who prefer the PC platform for DVD compression, go to DVD Shrink and it wouldn't let you down. Tips: For those who want to play the ripped movies or videos on mobiles, such as on iPhone or iPad, they can switch from iTunes to MacX MediaTrans, which is works more easily and effectively to transfer converted DVD movies and music from computer to iPhone iPad iPod in a flash, and vice versa with one or two clicks. Notice: We only advocate using those open-source free DVD rippers to copy and rip DVDs under the concept of Fair Use and do not encourage any illegal reproduction or distribution of copyrighted content. Please abide by the local DVD copyright law before doing it. Tips: If you want to watch converted DVD on iPhone iPad, you are recommended to turn to top-rated file transfer software, MacX MediaTrans, which allows you to transfer DVD movies from Mac to iPhone without iTunes sync in a blazing fast speed. And it can also remove Apple FairPlay DRM from iTunes purchased M4V movies, TV shows, M4P audio books, M4P Apple Music, etc. and sync iTunes purchases from iPhone iPad iPod to Mac, hard drive, Android phone/tablet, game consoles, Rokubox, Plex, smart TV, VLC player for limitless playback. Note: this software developer only allows users to remove DVD copyright protection and convert DVDs for legal personal use. Do Not rip DVDs for any piracy, illegal distribution or other illegal activity. Do Not impair other's legal benefits. Backup a Full DVD in 5 Minutes and digitize any DVD to MP4, MOV, MKV, etc at fast speed!